This will always be a Christmas classic :) Although the premise isn’t exactly realistic, does that really make it any less enjoyable?? My favorite part is definitely the “Rockin’ Around the Christmas” tree scene. I can’t explain why exactly, but I was always fascinated by the mechanics of it all. Wish I could have been that inventive as a kid, but then again…if my parents forgot me at home, I probably would have had a breakdown! I loved watching Will Ferrel on SNL “back in the day”, but unfortunately I have never been a big fan of his films. Elf is the exception :) Besides all of the hilarious lines, there’s also Zooey Deschanel and Peter Dinklage (yes, I love him!) to enjoy. Plus, it has a wonderful soundtrack! While we’re on the subject of Jimmy Stewart, I might as well talk about my absolute favorite Christmastime movie: It’s a Wonderful Life. There are so many things I adore about this film. Our new tradition is, right after Thanksgiving, to set up our Christmas tree and all of our decorations, and then eat Christmas cookies as we watch this movie. It’s a bit of a tear-jerker, but I always feel so incredibly happy after watching it! One of the best Christmas movies ever made (and another one that I watch all year round) is Love Actually. I love so many things about this film (with a couple of exceptions, like Billy Bob Thorton…gross): I love the way Hugh Grant says “Natalie”, I love Colin Firth’s story line, I love Emma Thompson!, and I especially love singing Bill Nighy’s character’s ridiculous Christmas song (and I do sing it, every time someone says, “I feel it in my fingers/toes/etc.). My best friends and I love watching this movie late at night as we squeal over the cheesy romance and laugh at the ridiculous British humor. If It’s a Wonderful Life is my all-time favorite Christmas film, Love Actually comes in at number 2! What are your favorite holiday films? Did any of yours make my list? 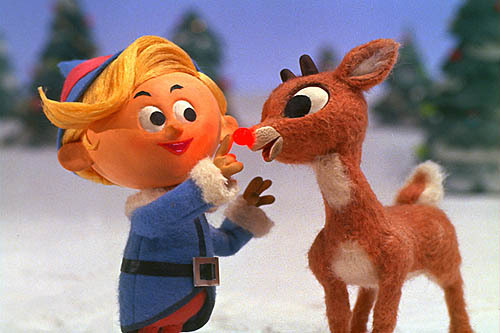 I enjoyed “Rudolph” when I was a kid – and I’m 55 now. It’s eternal, as your enjoyment of it proves! “Love Actually” is one my 30-year old daughter and I enjoy together; she’ll be visiting in January, and I’m looking forward to a little delayed-Christmas celebration with her. Merry Christmas – enjoy your time in the States! Oh my word, You’ve Got Mail is my favorite movie of all time!! And yes, it’s perfect for the holidays, even if it isn’t technically a Christmas movie. :) I can’t wait to watch The Shop Around The Corner…been wanting to! And yes, It’s A Wonderful Life is simply amazing. Huuuge Jimmy Stuart crush….